The Twitter Boom: Why iOS 5 is Twitter's Hero. I wrote an article a while back that was actually titled "Is Twitter in Trouble?". You should probably check it out if you already haven't, but regardless I will give you the gist. The article was about how Twitter was already lurking in the shadow of Facebook, and with all the hype Google+ was getting Twitter was pretty much being left out of the picture as a major social media competitor by most media outlets. Everyone pit Facebook against Google+ and vice versa, but the vast majority left Twitter out of the equation all together. Well yours truly now thinks there may be a change in the tide, read on to see why. _iPods have become extremely popular, and according to Apple's press conference earlier today, they are absolutely dominating the mobile music market, which most of us already knew. iTunes is still the industry leader in digital music. The cloud is becoming more and more important in computing and music. Apple knows this, and is trying to take advantage, but there is still more they can do to truly crush the opposition. 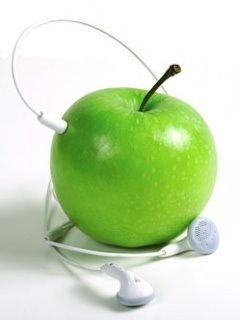 Even an Apple a day cannot keep Jobs' Dr. away: Illness forces Steve Jobs resignation from Apple. Inc. So I had a nice laugh this afternoon when I read that Lenovo thinks that the iPad’s dominance will not last. While that may or may not be true, even after 5 years, there hasn't been anyone who can take market share away from the iPhone, so I don't see how anyone is going to take down the iPad anytime soon. So what is this great company that's going to finally take down the iPad? Texting the New Carjacking Weapon of Choice? After recently writing an article regarding Google buying Motorola for $12.5 billion, I found this patent lawsuit visual humorous. 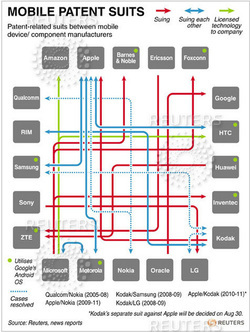 According to Jacob Goldstein of NPR, "The patent war is a key reason Google is buying Motorola for $12.5 billion: Motorola has some 17,000 patents that will belong to Google when the deal goes through..."
As usual, there is plenty of hype about the next generation iPhone from Apple. 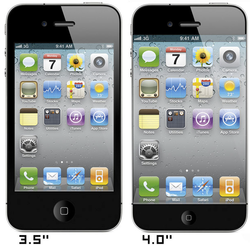 Whether it’s named the iPhone 4S or the iPhone 5 is yet to be officially announced. Plenty of rumors have been circulating about the newest iPhone, and with the unveiling and launch likely less than a month or so away everyone is wondering what rumors will become reality in the actual phone. From Apple to Zenith, we sort through all the tech news to bring you the most interesting of it all.